Hamilton had lots of models that came on a leather strap or a metal bracelet but there are handful of models that had a bracelet with both materials. The best of both worlds? Not in my book - I prefer a nice strap over a metal expansion bracelet but an original bracelet is always a nice find. Take for example, the 1968 Dateline A-476. It's an uncommon model and was only available for 1968 and 1969. 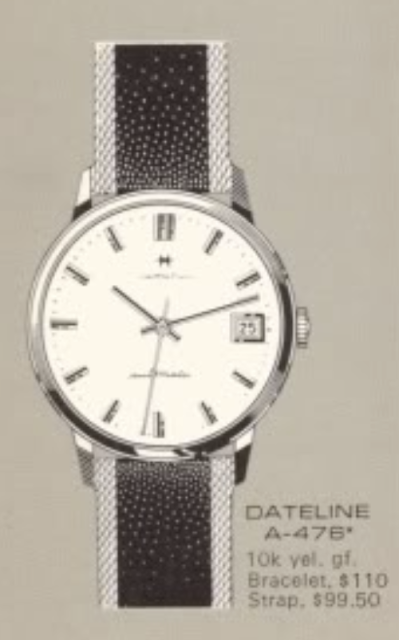 The Dateline A-476 came in a 10K yellow gold filled case and the bracelet was an option that came with an extra $10.50 price tag. That's about $70 in today'd dollars and you pay a little extra for a metal bracelet on Hamiltons made today too. You can't really tell from the catalog illustration that the A-476 has a strong black and gold theme going on. It reminds me of my youth, as this watch would have looked great with my Service Dress Blue US Navy uniform. Tucked inside the case is a 17 jewel 694A movement, basically a 689A with a date complication bolted on the front. My project watch came courtesy of a fellow collector and it really looks sharp. Like any fine watch, it needs to go to the spa every few years if it's going to be worn. Eventually the oil inside evaporates. The JB Champion bracelet has gold mesh surrounding what appears to be black suede. The other side of the band is the typical expansion links one normally sees on bracelets. With the crown and the crystal removed, the movement dumps out the front of the case. This movement is in great condition. The reassembled movement is ticking away with good motion. It's off to the timer to check it out further. Whoa! It's running a wee-bit fast and the beat error is crazy high. Fortunately it's very easy to adjust both factors. There... not too shabby. I'll leave it running a little fast as it should settle down eventually. The dial and the oscillating weight get reinstalled and next I can put it back into the case. I need to set the time forward until the date changes, then I can install the hands at 12:00 midnight. Normally I lightly install the hour hand so I can see how much progress I've made when setting the time. These movement just suddenly click when the date changes so I need to go slow enough that I don't overshoot midnight. Well, I can't say that the watch looks that much better after a little TLC but it surely is now running as nice as it looks. The hour markers have black stripes but they are hard to see unless the light hits them just right. This is definitely a dramatic-looking watch and you're sure to collect a few compliments while wearing it. I have one. Your strap looks GREAT! May I ask where you got it, please?